I started the DIY Postcard Swap back in 2010, and now eight years later it is still going strong – stronger then ever! And you are invited to join us! I created the Postcard Swap because I love mail art, mixed media, handmade postcards and sharing creativity with you, my dear blog readers. I love getting surprises in my mail box – and I know you do too, right? The swap has grown to be a beloved feature of my blog, and many participate year after year. I open this international postcard swap up for participants twice a year; once in spring and once again in autumn. Now it’s starting to feel (a little bit) like spring here in Sweden, so I’m inviting you to join today! 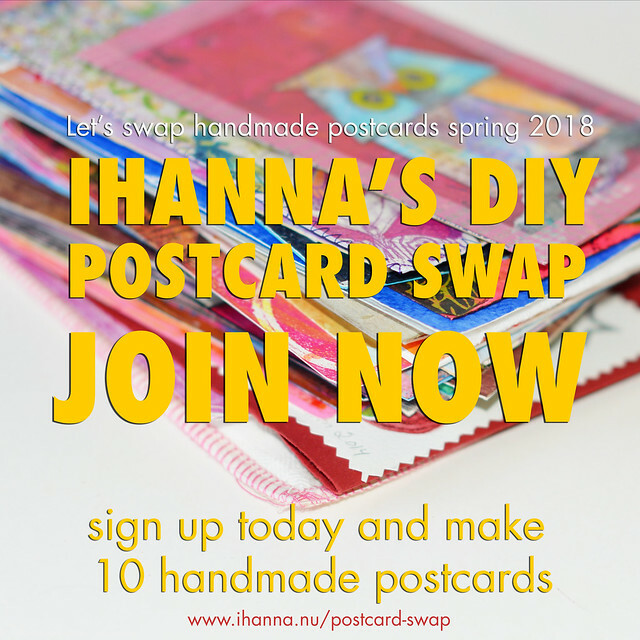 Make 10 handmade postcards, sign up before the 1st of May 2018, and after you send your postcards out you will start receiving your own bunch of lovelies from 10 other people. Doesn’t that sound just super awesome and fun? If you already know the deal and have done the swap before please join straight away by clicking the button above! If you’re new to the swap or just curious right now, please read the rules here and then join. We’d love to have you! Here is a view of how I painted my postcards on a piece of paper and then cut them apart, last year. They’re some of my favorites I’ve don. But you don’t need to be a painter to join. 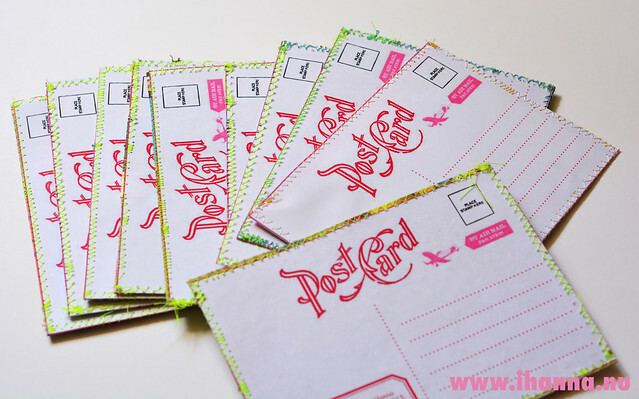 You can doodle, sew, draw, collage, or mixed media your postcards in your own fashion. The more inventive you are with your postcards, the greater you’ll feel when you are sending them out! Painted Kindness and Love Postcards from last year, cut and finished here. Also, if you need help with a theme or idea for your postcards, I’d be happy to help you with some tips – just post your question below. 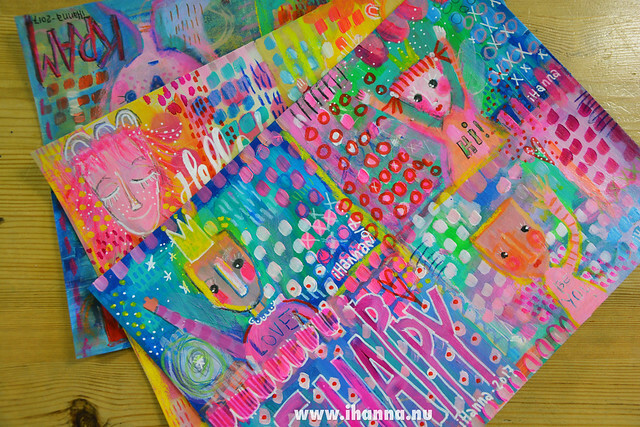 My Painted Princess Postcards, cut and finished here. Do you have an idea of what you want to do? Help me, and others in need, below with some inspiration for this year. Please share your thoughts on themes or preferred techniques below! Maybe you’re doing embroidered postcards this year? 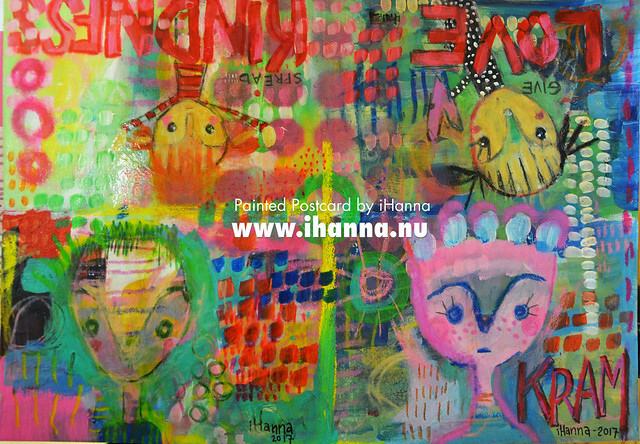 Sign up for the iHanna Newsletter – I send it out a few times each year and you will be the first to know of all things new and cool around here, plus when the autumn swap starts of course. This entry was posted in Mail bliss and tagged postcard swap, swapping. Bookmark the permalink. Så roligt! Jag var just in på hemsidan igår för att se om jag hade missat årets swap! Jag var med förra våren och var sugen på att vara med igen! I would love to participate, but I am moving 2400 miles in May and have to get the house ready for the move. I’ll definitely keep my eyes open for the fall swap! I totally understand that moving is a lot of work. I wish you good luck with that and I’ll be here with a new swap opportunity in the fall. Take care of you and yours Judy! Am based in Gujarat India, can I participate? Of course you can Pallavi! This is an international swap, so everyone is welcome as long as you can send 10 handmade postcards abroad on time. Looking forward to see what you make. I have participated twice and will again. I am curious to hear what people do with all of the ones they receive. I have used a lot of them in books I’m reading as bookmarks. What a cool idea! I love getting real mail, just like how I love reading books on paper. I am in between addresses (moving) but I am going to keep this in mind. Good idea! Your are very bright and happy! Haha, yes sometimes I am. Glad you wanted to join again Iryna!